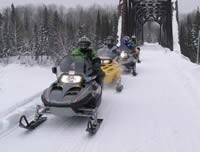 Thanks to Randy Dunlop and everyone involved in getting us out riding on beautiful Paugh Lake in the Madawaska Valley. 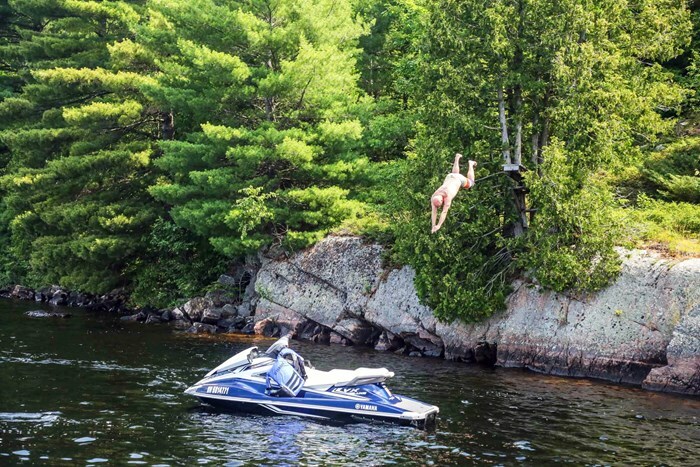 It’s yet another powersports gem area that Ontario has to offer. 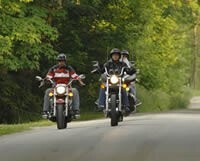 Whenever you ride or drive something for the first time, it’s smart to go out alone in your own space, test slow speed operations, hand controls, gauges, acceleration, moderate speed turns and so on, so you don’t accidentally hit something or someone, and so you know how the craft will react before you find out in a panic. 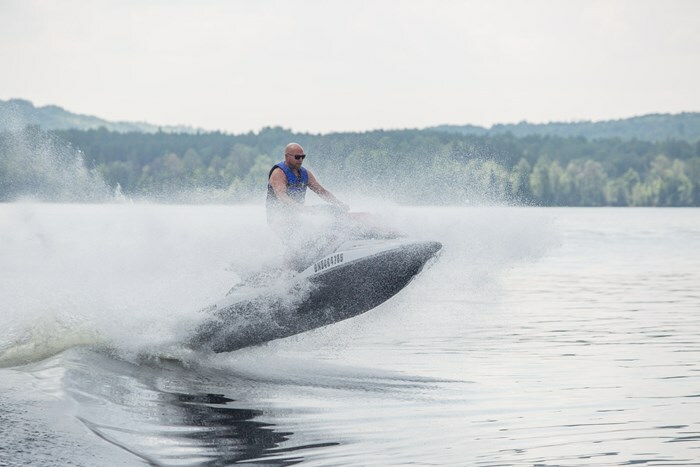 This is especially recommended for watercrafts, even with experienced riders, as all PWCs act and handle a little different. Safety first, just ask my What A Ride friends. Leaving the launch, I was very interested in testing the RiDE (Reverse with Intuitive Deceleration Electronics) on this 2016 Yamaha VX Deluxe. One tap of the left lever, and this craft was in neutral while retaining turning capabilities—wow! I can finally dock a PWC easily! 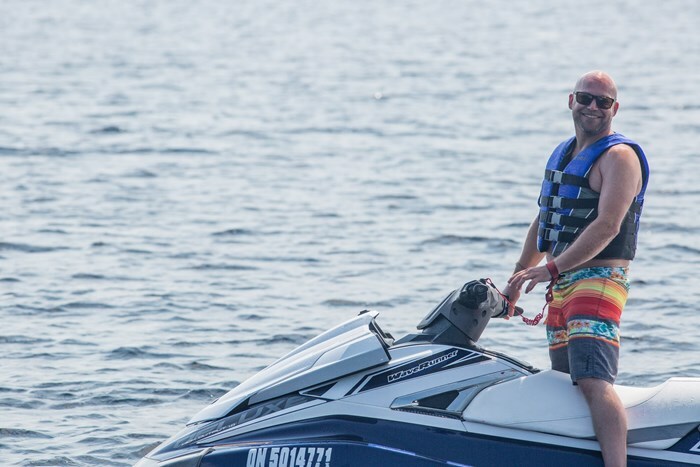 This feature alone gave me the immediate impression that this craft has excellent control capabilities, and is very safe; great for the family. Right from loading my gear in the ample front storage, my hat and waterproof phone in the cubby below the handlebars, and extra clothes in the medium-sized rear water-tight and removable storage bin, I had more than enough room for the day trip. I could have loaded my Klim Krew Pak, had room for two more, and taken off for three days. The craft was always comfortable, whether I was sitting cruising, sitting riding aggressively, or standing and playing around. The bars and controls are in a very natural position, and the buttons are all well-placed for safety. The footwell and “tunnel” were well formed and I left the day without any bruising. The early part of the day was a bit windy and choppy. The craft stayed planted, stable, predictable, and the jet always stayed in the water with no cavitation. It’s a 3-seater, yet I still found it agile, and fun to drive. The VX Deluxe has excellent turning capabilities and is a safe, and comfortable craft—great for overall confidence-building. 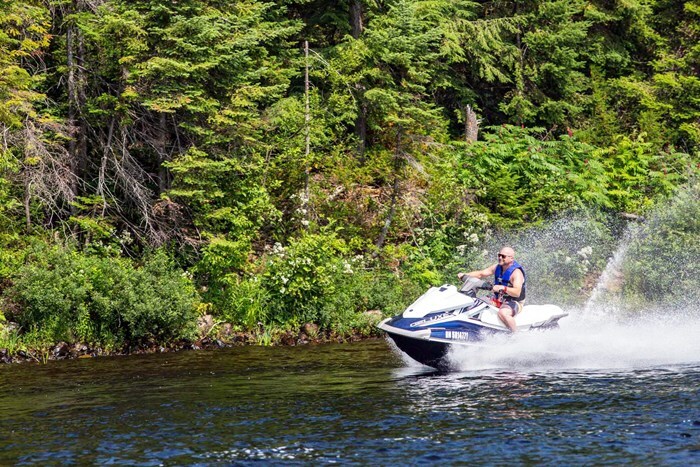 For 2016, Yamaha powered this craft with their then-new TR-1, 4-stroke engine. It is now 13% more powerful than the previous MR-1 engine, yet 40% smaller, and 20% lighter. As I haven’t ridden the previous Yamaha 4-stroke craft, I can’t compare them directly. What I can say is that the engine was very smooth, had very strong and linear power, and never skipped a beat. As I mentioned earlier, this 3-seater VX Deluxe craft has RiDE, which is controlled by two finger levers; the traditional throttle on the right, and the neutral/reverse/brakes on the left. It took a bit of getting used to but it’s a really nice, very ergonomic system, as your hands are always in a riding-ready position. To activate the brakes at speed, you just keep the throttle on, and pull the left trigger—voilà, it slows down gently, yet quickly, without splashing you in the face. All in all, the RiDE features are amazing. Also note that integrated into the engine’s computer is a module that assists in maintaining turning when the throttle is cut—now that, in my opinion, is a smart safety feature. This Yamaha also has Cruise Assist, which is the industry’s first system that allows the driver to set and hold a speed while maintaining a comfortable riding position with the throttle. Although I didn’t use it much, it did work well. 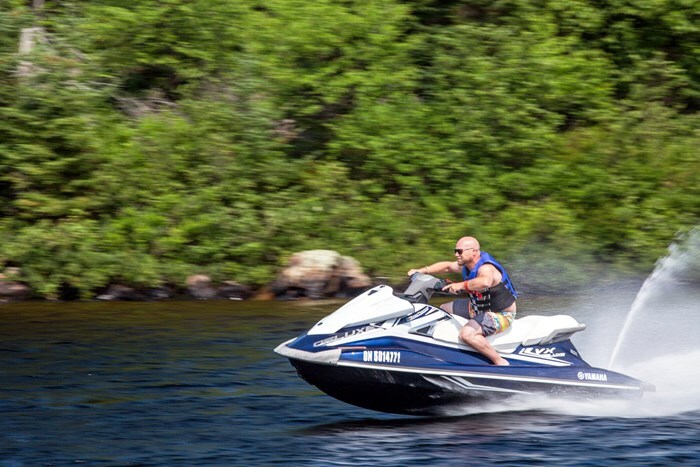 It also boasts No Wake Mode, which is designed for idling through no-wake zones. With features like these, it’s clear that the VX Deluxe would be a great option for longer tours. This is one of the most well-balanced watercrafts I’ve ridden. It’s not boring; it’s not too wildly exciting, and it’s exceptionally controllable. When running at speed, I could pull the left lever, slow down with full control, turn wherever I wanted, let the left lever out, and seamlessly continue on. So nice! 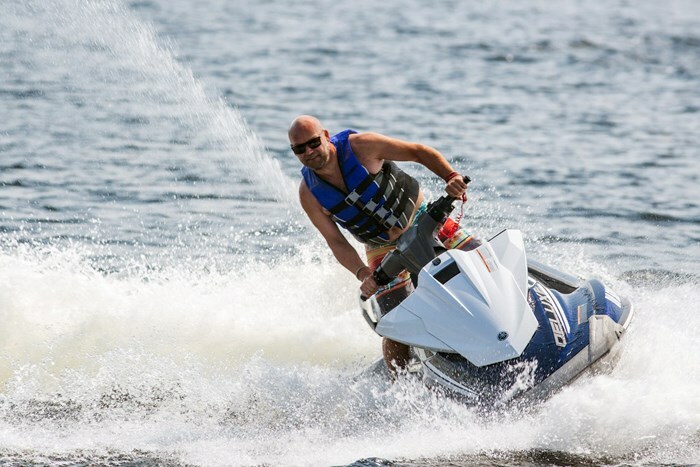 In a world where so many manufacturers are using bling, flash, and over complication to sell, Yamaha has a craft that quietly stands out as a winner. This is “Random” Ryan Tarrant saying thanks for reading! Check out and like my Facebook Page.